Hints of “the Mechanism” in Alaistair Reynold’s Blue Remembered Earth appear until it actually becomes a plot element, where we learn precisely what it is. Essentially, by 2162, people have been enhanced and interact with the data cloud via retinal implants and augmented reality. There is a major political system called the United Aquatic Nations, where people live in under-ocean cities, swim a lot, and where some have even undergone surgeries to make them into living mermaids. These people still use buttons and screens, as we do, but it seems this is mostly a necessity of their lifestyle choice. Because of the constant, internalized connection, people generate a massive amount of data which needs to be indexed (via posterity engines), while it is also being monitored. The Mechanism is the set of algorithms which constantly monitor the data stream, and intervene if signals indicate a certain action is underway, or about to be. When Geoffrey, a main character, gets so angry we wants to hit someone, the Mechanism recognizes this and strikes him with an instant debilitating headache. (p.283) The incident is logged, and he is then scheduled for a visit by a risk-assessment team to determine the seriousness of the matter. It is known as The Surveilled World. I recall being a child, going through a Catholic education, and realizing that according to the teaching, God could hear my thoughts. I felt exposed, my privacy violated, and embarrassed. Was there no respite from scrutiny? Twenty-five years later, I visited the Cloisters, the reconstructed (and frankensteined) medieval complex in New York. 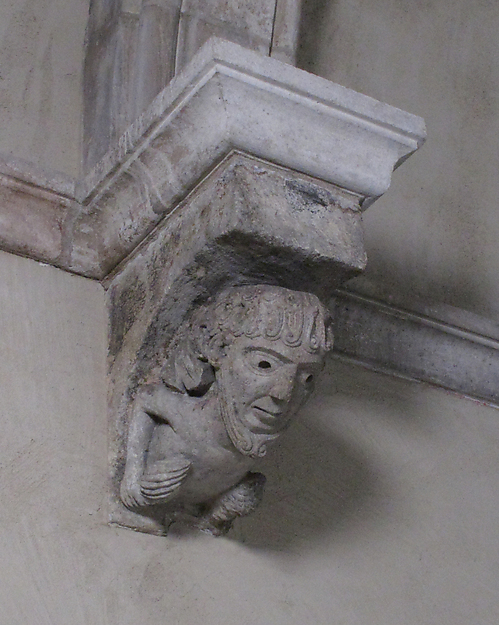 Throughout we see little heads gazing down from sculpted elements – these essentially are the medieval version of our black domed cameras, a reminder to the monks of eight-hundred years ago that they were constantly being watched, by a security apparatus of angels. It seems then, that we have some social need to construct surrogate parental oversight. That a society without watchers – a secularized society that doesn’t believe in spiritual spies and one without CCTV cameras (essentially the Western world for about a hundred and fifty years) cannot exist without engendering existential angst (as seemingly happened). This is worth quoting in full since it hints at Alastair Reynold’s larger project: Blue Remembered Earth is merely the first novel of a planned trilogy, reported to span into the far future. I imagine the next book will take place centuries ahead, and be part of the answer to this speculation. The referred to 5.9 kilo year event was a period of intense desertification occurring circa 3900 BCE which triggered worldwide migration to river valleys, from which emerged the first complex city-states. The character is suggesting that present climate-change is a similar event, which will drive us into new ways of living. In the book, one of these new ways is that of globalized surveillance, complete with a thought-control mechanism. The Mech then, is an interesting possibility about where we might be headed. The consequences of it are that, by 2162, there are no police forces and no jails. In the novel a news item is mentioned in passing about the demolition of the planet’s last jail, a facility in Mexico.